For as long as I can remember, I have been entranced by the victorious silhouette of the La Pasionaria sculpture that guards the city of Glasgow. 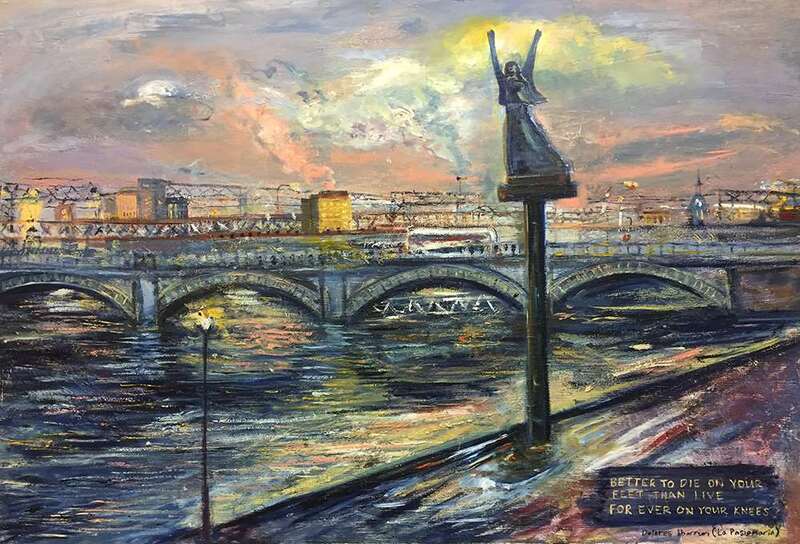 On the banks of the Clyde, she has always been a strong and dramatic sprit, both her arms aloft as she punches the sky. As a child, I viewed her as a youthful Glaswegian version of The Statue of Liberty, but it was only as I grew older that I discovered who this woman is and why she's here. In these troubling times, I find La Pasionaria a comfort and an enduring inspiration, both of which I have attempted to convey in this new work. I'm glad she watches over our city. Limited edition prints of this painting will soon be available in the online shop.